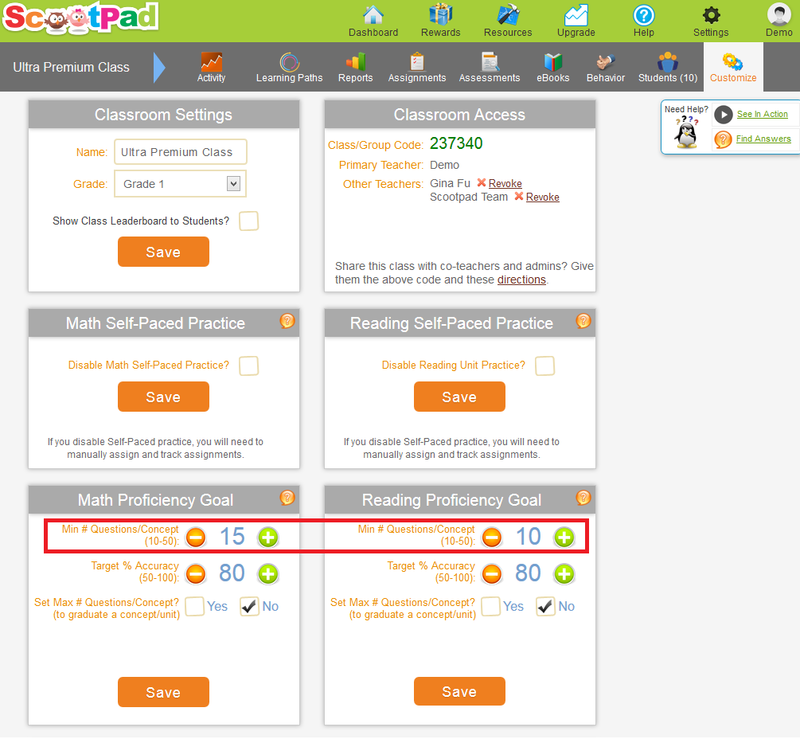 ScootPad is a great way to help your students prepare for standardized tests, such as the state tests many school districts are in the midst of this month. One struggle I know most teachers face is how to support students in their preparation for these important tests without letting the tests hijack the curriculum and the ongoing learning for students. For me, I try and keep things as consistent and simple as possible. For example, I change my classroom settings for the kids’ practices so kids no longer have the ability to retry a question and have it marked as correct if their initial answer was wrong. Obviously, high stakes tests only allow one opportunity for kids to get it right. Therefore, I try to emphasize the importance of problem solving and paying close attention so students are completely sure of their answer before bubbling in their choice or clicking the “next” button (see the unchecked “Allow One Retry” box below) on their practices. Because I also want my students to make the most of each practice and realize when they have made a mistake, I also enable instant feedback (see the Immediate Feedback box, checked, below). This set up allows my students to adjust and correct their answers while still in the midst of an individual practice. It’s simple to create review tracks within ScootPad to allow me to select the exact content I want my students to review. Because I have a good number of skills I want to review in a short period of time, I also set my number of correct responses to be lower before the platform moves my students to other review content (see below, where it is set at 10). To make these kinds of changes, click on the “customize” button in the top right menu bar of any classroom. Here is what that page might look like if you adjust the options: How do you help your students prep for high stakes tests?